What Should we Think About WEG 2018 Now that it’s Over? The eighth edition of the FEI World Equestrian Games had more than its share of problems, but then, problems seem to go with the genre. The compilation of eight world championships, up from six at the well-planned, highly successful first WEG in Stockholm 28 years ago, has gotten ever-more difficult and raises questions about whether it should continue. This WEG started out with a whole host of difficulties, from the omnipresent construction at the Tryon International Equestrian Center for the first week and part of the second; unseasonably hot/humid conditions that led to cancellation of endurance and the dressage freestyle and the usual logistical snafus common to the first days of a one-off event, as well as the complications of Hurricane Florence. Yet as things wrapped up yesterday, the WEG ended on a good note. The vendor village was bustling. A stellar individual show jumping competition made use of a great course designer, fabulous fences and memorable riding before a large group of fans. The home side won its first gold medal in four-in-hand driving, playing to a nice crowd on the afternoon following a well-attended marathon, though the stands were never full for any event over the two weeks. Sadly, the biggest crowd had been expected for the dressage freestyle. The success of the second week may encourage the FEI to stage another WEG, but we won’t know until after the General Assembly in November, when the subject will be discussed; exhaustively, one would hope. It remains to be seen what entity would want to put on something that is basically a black hole money-wise. Mark Bellissimo, the man behind this WEG and TIEC, is guessing he’ll have a seven-figure loss, but he plans to make up for it with housing he is building for a new town that is being created on his acreage. He believes people will come for the weather (when it isn’t hurricaning), the activities that run at TIEC and being in a horse-friendly area. 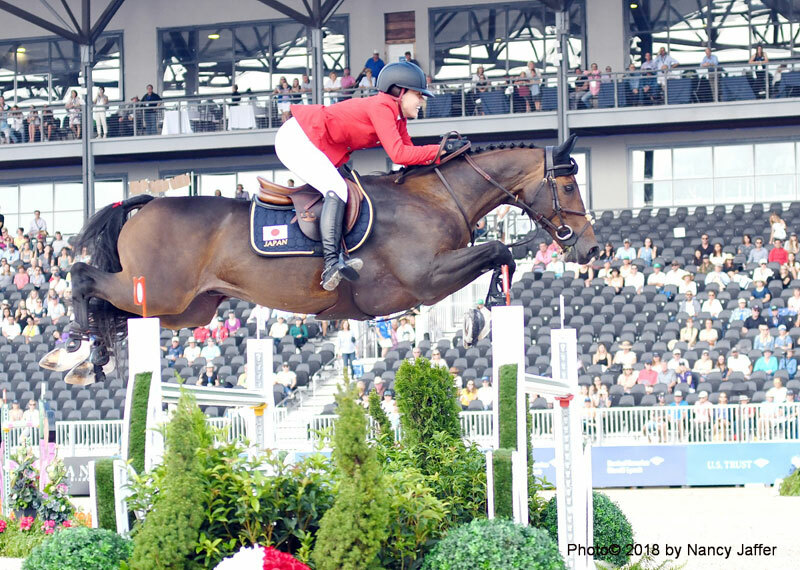 TIEC had only a little more than 18 months to get ready for WEG after Bromont, Canada—the original venue—lacked the financial support to continue. The danger of no decision until after November on whether there should be another WEG means that likely a bid wouldn’t be awarded until spring 2019 at the earliest. That would give a potential site only a little more than three years to organize and work on its facilities. At this point, no one has bid for 2022, though FEI President Ingmar De Vos said there has been some interest in the concept. There has been a lot of criticism of TIEC’s efforts—some of which is justified—but it is equally important to look at the other side. “Despite historic rains and very difficult circumstances, I would put up this sport against any of the other WEGs in terms of quality of the competitions,” maintained Mark, who apologized for shortcomings, particularly the lack of proper housing for grooms early on that was then rectified. “A number of people within the disciplines said, `This was as strong championship competition as I’ve seen.’ From a sport perspective, if the goal was to save the Games and produce top sport, I believe we did that,” Mark commented. There are those who would be happy to go back to single-discipline championships, or perhaps combine two compatible championships, such as eventing and driving, instead of doing a build-up and build-out for the larger demands of the WEG. Whatever the future of the WEG, the FEI would be wise to skip a quadrennium and if it decides in the end to have another WEG, not do it until 2026 or even 2030. The options are limited for a place that can hold the vastness of a World Games and do it right, but there are many venues that could handle world championships in one or two disciplines and make the experience enjoyable and less taxing.